← Rediscovered: Further Smackdown for Zane Grey! About two years ago now I finally got to Butte, Montana and environs, and knocked myself out roaming up and down those mean streets, checking for buildings that date from the Hammett era (and there are a lot of buildings standing from the 1920s and earlier). To make the most of it, I also did a reread on Red Harvest, the Op novel set in Butte (and/or Walkerville, the village just up the enormous hillside from Butte — you think San Francisco is hilly, trust me, hit Butte — damn). And this time, as I read merrily along, I noticed something that had never struck me before — a why the hell didn’t I ever notice this before moment. In short, the find deserves an essay. Before blurting it all out —- or taking the time to do up a proper essay only to find that everyone else on the planet already knows about this bit — I decided to check to see if anyone had noticed it before. Nothing in any of the biographies (honest, I don’t expect any cool litcrit from the biographers, it not in their wheelhouse). Of the litcrit volumes I have on hand, Peter Wolfe in Beams Falling and Rhino Thompson in Hammett’s Moral Vision uttered not a peep. (I’ve always disliked Wolfe’s handling of The Maltese Falcon, but looking through his entire book again, I saw that he really gets into the Continental Op stories — and anyone who digs the Op is okay with me.) 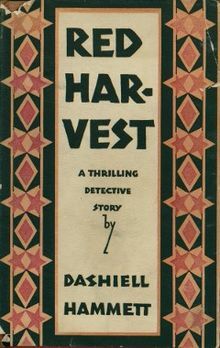 Only Dennis Dooley in his book Dashiell Hammett from Ungar (1984) touched on the discovery, without going for the whole thing. Dennis is a great guy, he took the tour in 1995, so if he’d claimed the total find, that would have been okay with me. One less essay to write. But, in the books I have on hand, no, not the whole bit. In a quick search of the web, nothing. Since I don’t have on hand every essay on Hammett that has ever been done, and don’t have time to look through every comment in every usergroup in all the chatrooms in all the world, I’m going to presume I found something new. And I’ll write it up, sometime in the future. But if someone got to it first in some piece buried in a journal I haven’t read or on a website I haven’t seen, I apologise in advance. If I’ve never heard of it after more than three decades of leading The Dashiell Hammett Tour, maybe, just maybe, it might be something new. This entry was posted in Dash and tagged Butte, Cap Shaw, Dennis Dooley, Peter Wolfe, Red Harvest, Rhino Thompson, Walkerville. Bookmark the permalink.